EURMASK® UNO is a one-size-fits-all half mask carrying one filter holder ideal for the protection against dusts, both gross and thin. It's best used in wood work, marbles, paint stripping, grinding and D.I.Y. in general. Thanks to a soft TPE rubber face seal this mask adapts well to the face while the rigid holder holds the filter. The silicon expiration/exhalation valve is mounted on a highly resistant plastic base and protected by a cover. 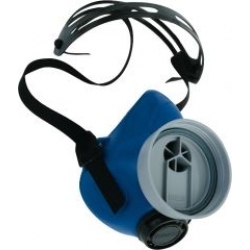 The EURMASK® UNO half mask can be used with filters EURFILTER® 7364 P2R for the gross dust particles and the 7365 P3R for the thin dust particles.